Talk to family members and they’ll insist that the second spouse died of a broken heart. And that may literally be true in some cases. George H.W. 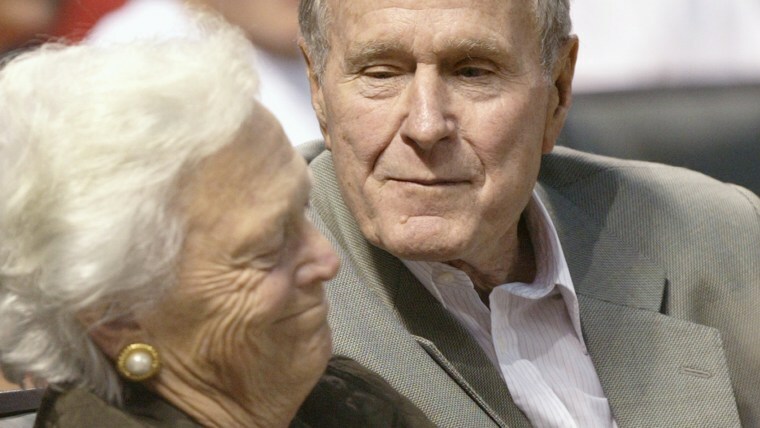 Bush took his last breath just a few months after his beloved wife Barbara died in April at 92. Perhaps it's a testimony to the power of love: Couples can feel so deeply that when one spouse dies, the other succumbs soon after. The late president was honored Wednesday at a state funeral at the Washington National Cathedral. "Dad is... holding mom's hand again," his son, President George W. Bush, said in his eulogy, imagining his parents in Heaven. The late commander-in-chief's granddaughter, Barbara Bush, said during some of her final conversations with him, her grandfather appeared reflective about losing his lifelong companion. "I asked him if his heart was broken and he said yes. And then he looked at me and he said, 'Do you think it'll feel worse than this?' And it just really got me," she told TODAY. "I mean, of course, his heart was broken. He had lost the love of his life." Jenna Bush Hager recalled at one point saying she couldn't believe her grandfather died right before Christmas. But her daughter put it into sweet perspective using her nicknames for George H.W. and Barbara Bush. "Mila said, 'Of course it's happening right before Christmas. Gampy had to get to Ganny so he could decorate their Christmas tree," Jenna recalled. "And I thought from the mouth of babes, because they had never spent a Christmas apart... so of course he wanted to be there." Over the years experts have suggested a multitude of explanations for close coupled deaths among spouses, ranging from the more spiritual — two souls so closely intertwined that they can’t be pulled apart by death — to the more down to earth — hearts literally broken by chemistry of grief. There’s no question that love can lead to a very physical connection. Researchers have shown that couples grow closer and closer over the years to the point where their hearts may actually beat in sync. One study, in fact, monitored six longtime couples’ hearts as they slept. When the couples lay next to one another, their hearts began to beat in rhythm with one another. A study published in 2013 in the Journal of Nursing Research found that widowhood, chronic disease and physical function were all strongly associated with the risk of death in older people. The findings suggest that “greater attention should be paid to these factors to reduce elderly mortality risk,” the researchers concluded. But exactly what’s killing these surviving spouses isn’t always clear. Dr. David Casarett isn’t sure why some spouses’ deaths are so closely coupled. But he’s definitely seen the phenomenon. And while some may indeed die of broken heart syndrome, others, Casarett suspects, die from the burden of caring for a desperately ill spouse for years. Once the ill spouse passes, the remaining one sometimes is too drained and too depressed to go on. “While it’s scientifically interesting to think about the physiology of these deaths, it’s also important to consider the social and cultural factors,” he says. “Sometimes the surviving spouses stop taking care of themselves. Sometimes they become depressed. Dr. Gary Small, director of the Longevity Center and the division of geriatric psychiatry at the University of California, Los Angeles, agrees.